This article is 234 days old. As time rolls by, local organizers of one particular sport are starting to pin things down. Hosting a registration open house for Youth Bowl Canada (YBC,) Playdium 5 pin Lanes (located at 4985 Wyandotte Street) is preparing for the season. The event, taking place from 6pm to 8pm n Wednesday, August 29th, will offer those interested a chance to enrol their kids into the league. In addition to signing-up, the open house will have some perks for new registrants. Starting on September 8th and 9th, the league has many age groups. Known as Bowlasaurus, children 3-5-years-old bowl one game with bumpers and can do so on Saturdays at 9:30am or 11:15am with a weekly fee of $4.50. Peewees (ages 5-7) bowl two games on Saturdays at either 9:30 a.m. or 11:15 a.m. with a weekly fee of $8. Bantams (ages 8-10) can bowl Saturdays at 9:30am, 11:15am or Sundays at 6:15pm. Juniors (ages 11-14) can bowl Saturdays at 11:15am or Sundays at 6:15pm. Seniors are 15-19-years-old and bowl Sunday nights at 6:15pm. These three groups all bowl 3 games with a weekly fee of $10. Bowling isn’t the only thing youth can expect when participating in YBC however. Last year was a successful one for bowlers as well. 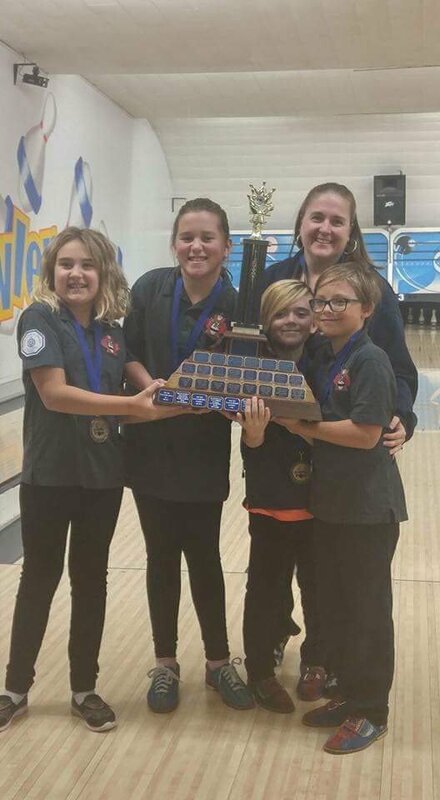 One master youth team, (consisting of a Bantam and Junior) and a master bowler won the provincial finals in Peterborough. Senior bowler Emma made the youth challenge Ontario all-star team, a collection of the top three boys and girls from the provincial finals. She also competed at the nationals in Ottawa. Success wasn’t just about winning either, as shown by another unique competitor. Over the years, the program director has also witnessed other success stories. The memories they’ve created aren’t just from finishing in first place though. Having a youth program for over 50 years, it’s a major focus at Playdium. As a foundation for the sport, most people who start through YBC continue on through several generations. Pickering herself played in the league, began coaching as a teenager and has been program director for nine years — This came after her mom held the title for 23. As an inexpensive alternative to many fall sports, bowlers participate equally — being placed on a team, everyone works together. Most competitions are based on pins over average, which means anyone can qualify. Beyond major successes, those involved strive to help youth in many ways as well. Making it a fun time, coaches always provide encouragement and teach sportsmanship. It’s something Pickering finds just as exciting as her other league experiences. Those looking for more information can visit Playdium YBC’s facebook page or e-mail [email protected].